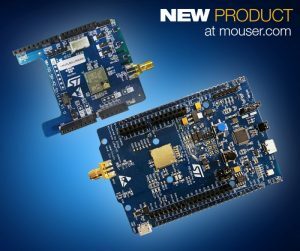 Mouser Electronics currently offers the STMicroelectronics STM32 LoRaWAN Discovery Board. The new Discovery Kit and I-NUCLEO-LRWAN1 STM32 LoRa Arduino-compatible extension board (available to order from Mouser) offer you a development platform for learning and evaluating solutions based on LoRa and FSK/OOK radio frequency (RF) communication. The ST STM32 LoRaWAN Discovery Kit is based on an all-in-one Murata Type ABZ open module solution to address low-power wide area networks (LPWAN) and support the LoRaWAN long-range wireless protocol. An STM32L072 ARM Cortex-M0+ microcontroller—featuring 192 KB of flash memory, 20 KB of RAM, and 6 KB of EEPROM—powers the Type ABZ mdoule. The STM32L0 ultra-low-power microcontroller offers low-power design features, targeting battery-powered and energy-harvesting applications. ST’s I-NUCLEO-LRWAN1 STM32 LoRa extension board includes a LoRaWAN module powered by an STM32L052 microcontroller, an SMA connector, a 50-Ω antenna, and headers compatible with Arduino Uno R3 boards. The board features three ST environmental sensors: an LSM303AGR accelerometer and magnetometer, an HTS221 relative humidity and temperature sensor, and an LPS22HB pressure sensor. Both the Discovery board and NUCLEO board come with LoRaWAN class A-certified I-CUBE-LRWAN embedded software that enables designers to set up a complete LoRaWAN node.